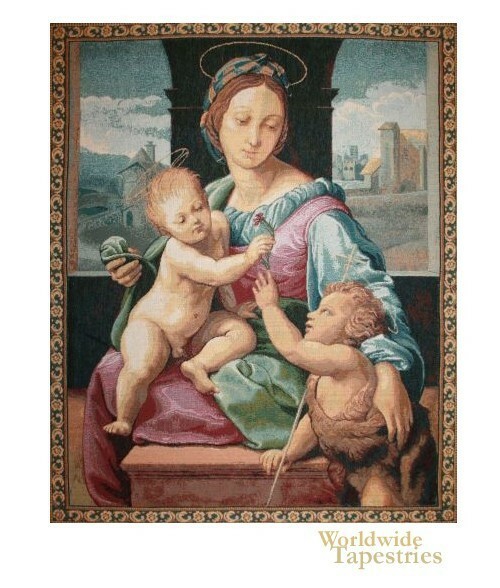 This religious Renaissance religious tapestry "Madonna Aldobrandini - Raphael" shows the work of Raphael from 1507. this work shows the Virgin Mother, the Christ child and the infant John the Baptist. True to the original, we see a scene with the three interaction in a room, with the Roman landscape seen through the windows. Like the Madonna of the Meadow, the three subjects are seen in triangular formation, typical of the religious works from the era. This is a beautiful work of Raphael. When Raphael was in Florence from 1504 to 1508, he produced works depicting the Virgin and Child, seventeen of which survive to this day. The color and composition is masterful, balanced and effortlessly flowing, and the use of light shows the delicate differences in textures of the skin, garments and the landscape. This religious Renaissance art tapestry "Madonna Aldobrandini - Raphael" is lined and has a tunnel for easy hanging.